We have received 17 reviews of Thornhill . You can add a review or scroll down to read reviews. To send in your review of Thornhill , please fill in the info below and click the button labelled Send Review Now. Reviews will be checked by our team before they appear on the website. Your last name will not appear on the site, but we need to know who you are in case you win a prize! Pam Smy is an illustrator and author based in Cambridge. She studied Illustration at Cambridge School of Art, part of Anglia Ruskin University. Pam studied BA (Hons) Illustration going on to study the MA Children's Book Illustration in 2001. As a student, Pam was awarded 3rd place in the Macmillan Prize, a project that led to her first picture book contract with Egmont Books in 2003. 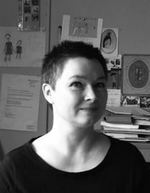 Pam is now lecturer at the School of Art, teaching children's book illustration. She has illustrated books written by other authors, and Thornhill is the first book she has written and illustrated herself. As she unpacks in her new bedroom, Ella is irresistibly drawn to the big old house that she can see out of her window. Surrounded by overgrown gardens, barbed wire fences and 'keep out' signs. It looks derelict. But that night a light goes on in one of the windows. And the next day she sees a girl in the grounds. Ella is hooked, the house has a story to tell, she is sure of it. Enter Thornhill, Institute for Children, and discover the dark secrets that lie within. But once inside, will you ever leave? Pam has illustrated books by many authors including Julia Donaldson, John Agard, Arthur Conan Doyle, Siobhan Dowd, Penelope Lively and Linda Newbery. Pam is a fan of novels with strong female characters whose circumstances are related to the surroundings they are in. She regularly re-reads classics such as Jane Eyre, The Secret Garden, Rebecca and Wuthering Heights. She particularly admires stories that develop a strong sense of atmosphere, history and suspense. You can see examples of Pam’s illustrations on her Instagram and her Facebook pages, and learn about her experience of writing and illustrating her very own book. 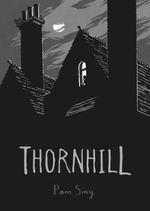 Thornhill is a complicated, dark story from two perspectives set thirty-five years apart, one told through pictures, one told through a diary. As you read you connect with the characters and in particular Mary. Mary has trouble talking to most people and lives in a children's home, which makes for a great story and interesting perspective. This book is well worth, in my opinion, multiple reads and packs emotion thoughts and feelings into a short book with amazing illustrations. William gave Thornhill 5 out of 5 and now plans to read Countless by Karen Gregory. I found the pictures were very good and brought a new piece of information with them. I liked the storyline as it was quite creepy. It was definitely a different style of book but I really enjoyed reading it. Grace gave Thornhill 4 out of 5 and now plans to read Troublemakers by Catherine Barter. Thornhill was amazingly writen. It faced the issues of loneliness and growing up in the British foster system in a grown up way with out over exaggerating these isues. It also incorporated images into the story that made it easy for people who are less confident at reading. Finaly, the plot of this story (acompanied with the pictures) was easy to follow and verry intresting. Deaven gave Thornhill 5 out of 5 and now plans to read Countless by Karen Gregory. The pictures were beautifully illustrated but I thought that it didn't include enough of the narrative, who was a beautiful character. I was able to read it in one sitting and left you with many unanswered questions. Tessa gave Thornhill 2 out of 5 and now plans to read Countless by Karen Gregory. I found the story easy to read yet very complex, I loved how the pictures told a completely separate story that still linked in with Mary’s point of view. The only problem was that I found was that Ella’s story was quite confusing as there wasn’t any real writing about her or her story until the newspaper at the end, meaning I didn’t fully grasp what the pictures were showing until I read the article. Hannah gave Thornhill 5 out of 5 and now plans to read The Crash by Lisa Drakeford. Thornhill is a good story. I found it a bit confusing as I think that the pictures were telling the story, from the point of view of Ella, which it took me a while to pick up on. I definitely feel sad for Mary and her having to go through what she did. Sam gave Thornhill 3 out of 5 and now plans to read The Crash by Lisa Drakeford. Although short, this story included a gripping narrative, as well as beautifully illustrated images. River gave Thornhill 4 out of 5 and now plans to read The Crash by Lisa Drakeford. Mrs gave Thornhill 4 out of 5 and now plans to read Troublemakers by Catherine Barter. I found this book rather creepy but I found it to be a good read that I enjoyed. The pictures were very detailed and the way it was written is very interesting and I found the ending very unexpected. I would highly recommend. Harrison gave Thornhill 4 out of 5 and now plans to read All About Mia by Lisa Williamson. This book is such an astounding read because of the fact that it is half comic half diary. I'm giving it a five because it is creepy and it put me on the edge of my seat every time I read a new page. At one point it even made me have nightmares. The story line is really good because it shows what happens when you bully someone. I find it is a very good anti-bullying book. And it teaches you that even a little bit of bullying can change someone's life. Kaiden gave Thornhill 5 out of 5 and now plans to read The Crash by Lisa Drakeford. I absolutely loved reading this book and found it difficult to put down. It has been written in a way that intensifies the sense of mystery in the story; the way the author has used both text and images to slowly reveal this thrilling story is genius. The plot is captivating and is built up slowly, so as to create suspense. The characters are amazingly brought on and you can understand them well. Olivia gave Thornhill 5 out of 5 and now plans to read Countless by Karen Gregory. This book is truly phenomenal. Every illustration is filled with emotion and meaning, fear and love as if the author had crafted it from fragments of her own heart. This book left me in a heap of held back tears and heartbreak-it is absolutely fantastic and fully deserves its place on this list. Poppy gave Thornhill 5 out of 5 and now plans to read Countless by Karen Gregory. At first, I did not think much of this book and would go as far to say that I didn't enjoy it (though the other reviewers would disagree) but by the time I got to the end, I felt like I had discovered a treasure trove. The diary entries were realistic and the illustrations were heartwarming (especially the final shot of the two smiling). I would recommend this book to anyone looking for a quick but meaningful read. Jem gave Thornhill 4 out of 5 and now plans to read Noah Can't Even by Simon James Green. A phenomenal book. The story is so deep and meaningful. I love how the two girls in completely different times come together at the end; in the last picture, when they are smiling together, it was heart-breaking and so sweet. Also the repetition of the beginning at the end of the book emphasises the strong emotions of despair which made me cry even more. The detail in the illustrations, the expression in the writing - the whole book expresses so much emotion and fear. I would give "Thornhill" a 10 out of 5 if I could; I loved it so much. Heather gave Thornhill 5 out of 5 and now plans to read Countless by Karen Gregory. I absolutely loved this book, the art in it was amazing and the story was so different to anything else Iâ€™ve ever read. I found that at the beginning the book was really sad but it was also slightly creepy. This is now definitely one of my favourite books. Emily gave Thornhill 5 out of 5 and now plans to read The Crash by Lisa Drakeford. I loved this book because of how it was cleverly set out and I loved the illustrations and the story they told. I thought this book was: strange, cleverly set, artistic. Bethany gave Thornhill 4 out of 5 and now plans to read All About Mia by Lisa Williamson. I'm speechless. The artwork is fantastic, the diary entries are so realistic and humbling. The way the two story lines came together in the end is seamless. Smy took such a deep and close to home topic for me and manage to capture all of the emotions that bullying and loneliness entails. Thornhill is so well written and absolutely awe inspiring. I will definitely re-reading this book many, many times. Kira gave Thornhill 5 out of 5 and now plans to read Countless by Karen Gregory.